I’m sure all of you remember the very first Invisible Man sequel, The Invisible Man Returns. That movie featured a slightly prissy owner of a mine who is wrongly accused of murdering his brother. The accused has a doctor at the mine shoot him up with some invisible juice so that he can be free to roam around looking for the “real killers.” While he does this, he also has to hurry up and get it done before the drug makes him crazy. 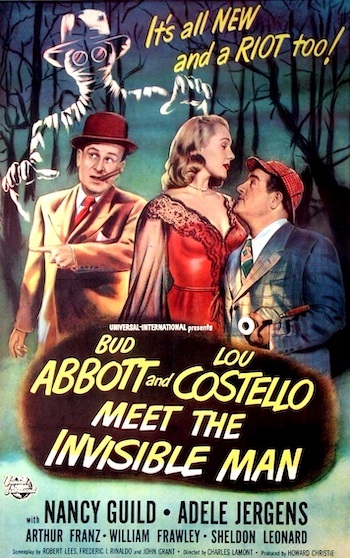 I rehash all this because Abbott and Costello Meet the Invisible Man rehashes all this. In this version, Tommy Nelson is a prizefighter who’s wrongly accused of killing his manager. He gets his hands on some invisibility serum and uses it to find the people who really killed the manager. 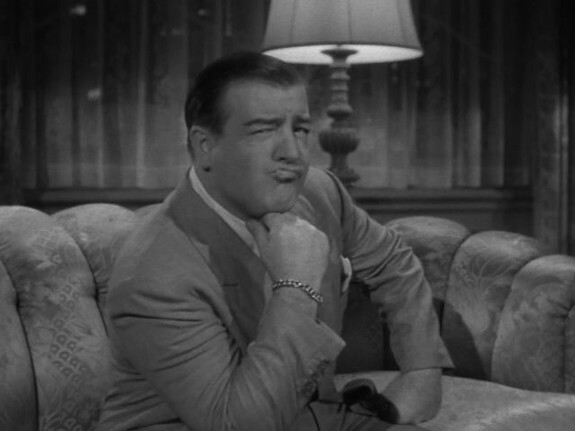 Abbott and Costello assist him in his efforts. A&C have just gotten their diplomas from a detective school and are assigned to the night shift at a local detective agency. 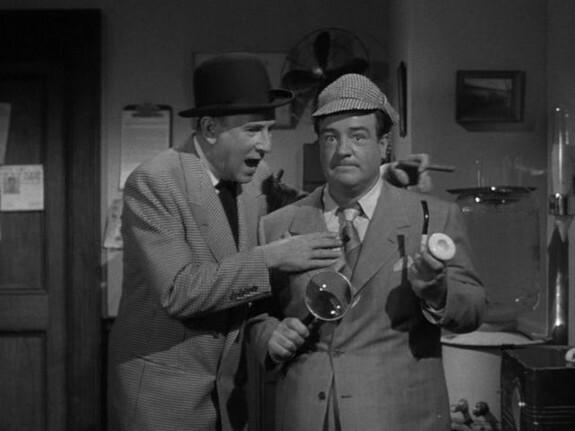 Lou amuses himself by prowling the office with his Sherlock Holmes deerstalker cap, a pipe and a gigantic magnifying glass, much to Bud’s constant consternation. Suddenly a dude bursts into their office and starts looking out the window while the radio in the office is describing murder suspect Tommy Nelson. Of course the description fits the person who just came into the office and Lou is the only one who notices this. As usual, Bud is oblivious to his little buddy’s facial contortions, strange noises, and mammoth double takes. Eventually, Tommy tells the boys that he is not guilty of the crime and that he refused to throw a fight to a guy named Rocky Hanlon who a mobster named Morgan was backing. For Tommy’s dirty little double cross, Morgan had Tommy’s manager killed and set Tommy up to take the fall. Bud and Lou decide that this could be their first big case and go with him to his girlfriend’s house where her uncle works on his invisibility serum, all the while intending to rat him out to the cops. This movie does better alluding to the past Invisible Man movies than some of the earlier official sequels in that the doctor actually mentions the first invisible man by name and states that the drug drove him insane. Then we kind of focus in on a framed picture of Claude Raines who is posing for what looks like an actor’s headshot. Tommy, whose job is to get punched in the head, ignores the warnings of the doctor and shoots himself up with the invisibility drug and disappears just as the fuzz arrive. Only Lou has seen Tommy become invisible and no one believes him, so they ship him off for an extended scene with a police psychologist. Lou ends up hypnotizing numerous people to sleep in the office and there’s lots of supposedly funny dialogue between him and the shrink. That’s really the problem with these A&C movies. You can tell they were trying to work in their signature spots into the film and since those types of “wacky comedy routines” were their strengths, you can’t really blame them, but in this film, the routines slow an already uninspired and retread of a story to a crawl. Finally the plot lurches back into motion and eventually Bud and Lou decide to help Tommy out. 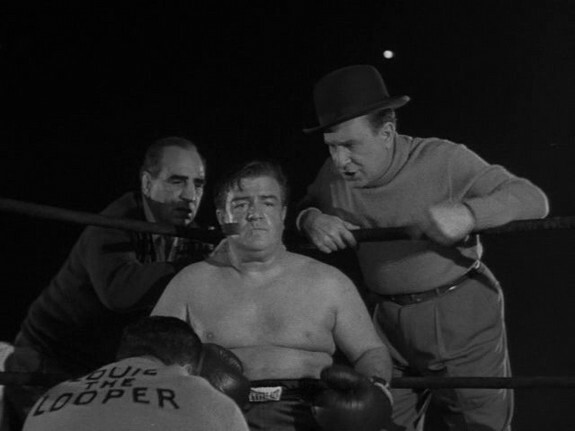 The last twenty minutes of the movie is Lou farting around in the ring getting knocked around by Rocky Hanlon while Rocky Hanlon gets knocked around by phantom punches from an invisible Tommy. In some of their other monster efforts, it was amusing (sometimes more so as in Abbott & Costello Meet Frankenstein, sometimes less so as in Abbott & Costello Meet The Mummy) to see familiar and deadly serious monsters do battle with the clowning buffoonery of Bud and Lou. Here, it just didn’t matter since we had seen all this stuff before in the regular Invisible Man movies. We’ve all seen the doors slam shut, people doing pratfalls, items moving inexplicably, and even the invisible man getting drunk (shoot, we saw that in The Invisible Man’s Revenge and in The Invisible Woman, not to mention this one). A completely uninvolving movie, that does succeed in making 83 minutes of your life disappear.